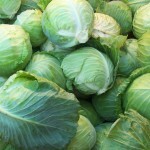 Over 1.5 million pounds of fresh produce were donated. Our total fresh produce donated since our beginning is over 7.7 million pounds. More than 9,100 people volunteered for America’s Grow-a-Row. America’s Grow-a-Row hosted 1,039 children from low-income areas at our farm for Grow-a-Row Kids Farm Days to learn about healthy eating and farming and harvest fresh food for their families. Through our Recipient Volunteering program 679 youth and adults came to our farm to harvest produce for themselves and for other communities in need. Recipient Volunteering events provide an opportunity for those who receive our produce to give back to the program in a meaningful and fulfilling way. America’s Grow-a-Row expanded our remodeled education program, piloted in Jersey City, to include multi-session education programs in Newark and East Orange as well. We strategically overhauled our education program to delve deeper into the communities we serve by implementing a more effective, multi-lesson curriculum to make greater impact and consistently change the habits and lives of those we serve. America’s Grow-a-Row began Teaching Kitchen and Education Center renovations at our headquarters, supported by the Robert Wood Johnson Foundation. An anonymous corporate foundation granted us $215,000 to support construction of a new storage facility and loading dock at our Pittstown farm. Our corporate employee engagement volunteer program continued to expand, including beyond the local region. For example, a team from Coupons.com flew in from Cincinnati to volunteer with our program as a team-building activity. America’s Grow-a-Row educated 3,853 people in schools, community centers, churches, and workplaces about nutrition, healthy eating, the hunger crisis, farming, and volunteerism through our Off the Field education program. America’s Grow-a-Row’s Fresh Produce Initiative program donated 542,000 pounds of fresh fruits and vegetables through the Community FoodBank of New Jersey. America’s Grow-a-Row forged a new partnership with City Harvest in New York and distributed over 540,000 pounds of farm-fresh produce to the five boroughs of New York City. 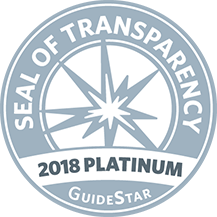 Through our new partnership with Philabundance in Philadelphia and our new Free Farm Markets in Pennsylvania, we infused nearly 200,000 pounds of fresh fruits and vegetables into the eastern Pennsylvania region. 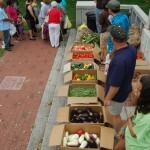 America’s Grow-a-Row ran 176 Free Farm Markets. The markets, which run weekly in Newark, Jersey City, East Orange, Morristown, Philadelphia, and Bethlehem, PA and bi-weekly in Camden during the harvest season, allow local residents in need to come and select produce at no cost. Congressman Leonard Lance visited our farm and spoke to a group of AT&T employee volunteers. The Rider College Russian Delegate Program visited our farm to learn about our program and farming techniques. Chip Paillex participated on the panel and was a guest speaker at the Rutgers School of Environmental and Biological Sciences Local Food Panel. Our fifth annual Farm to Fork Fundraiser, held at Life Camp in Pottersville, New Jersey, honored Impact 100 Garden State and raised over $109,000. America’s Grow-a-Row’s Annual Fund Campaign raised over $75,000. Our fifth annual Pennies 4 Produce fundraiser, run by students and community members of all ages and facilitated by local merchants, raised almost $4,000. America’s Grow-a-Row raised over $6,500 through our Perennial Club Membership program. America’s Grow-a-Row received the 2017 Bank of America Neighborhood Builders Award and was named the New Jersey Association of Student Councils State Charity for 2017-18. 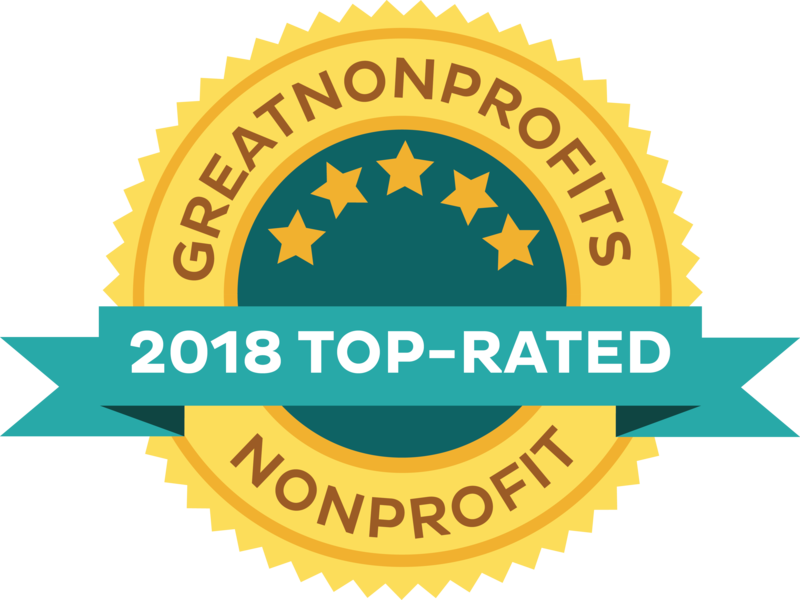 For the fifth year in a row America’s Grow-a-Row attained Top-Rated status with Great Nonprofits, the leading provider of ratings and reviews of non-profit organizations across the nation. Over 1.2 million pounds of fresh produce were donated. Our total fresh produce donated since our beginning is over 6.2 million pounds. More than 7,100 people volunteered for America’s Grow-a-Row. Almost 750 children from low-income areas visited our farm to attend Grow-a-Row Kids Farm Days to learn about healthy eating and farming and harvest fresh food for their families. America’s Grow-a- Row’s Recipient Volunteering program hosted 343 youth and adults at our farm to harvest produce for themselves and for other communities in need, as a way to give back in a meaningful and fulfilling way. America’s Grow-a-Row strategically remodeled our education program and piloted the remodel through our Essex-Hudson Hunger Relief and Healthy Eating Program. We overhauled our education program to delve deeper into the communities we serve by implementing a more effective, multi-lesson curriculum to make greater impact and consistently change the habits and lives of those we serve. America’s Grow-a-Row educated 1,845 people in schools, community centers, churches, and offices about nutrition, healthy eating, the hunger crisis, farming, and volunteerism through our Off the Field education program. America’s Grow-a-Row ran 118 Free Farm Markets. The markets, which run weekly in Newark, Jersey City, East Orange, and Morristown and bi-weekly in Camden during the harvest season, allow local residents in need to come and select produce at no cost. America’s Grow-a-Row’s Fresh Produce Initiative program donated nearly 1 million pounds of fresh fruits and vegetables through the Community FoodBank of New Jersey. America’s Grow-a-Row participated in the Rutgers Greek Project Team’s Greece Food Aid System Workshop. The Office of Congressman Leonard Lance joined us in the fields to harvest over 3,500 pounds of cucumbers. America’s Grow-a-Row’s Annual Fund Campaign raised over $70,000. America’s Grow-a-Row’s fourth annual Pennies 4 Produce fundraiser, run by local students and community members of all ages and facilitated by local merchants, raised nearly $7,400. America’s Grow-a-Row raised $3,600 through our Perennial Club Membership program. Chip was honored by the Farm Credit 100 Fresh Perspectives program. Our total fresh produce donated since our beginning is over 4.9 million pounds. More than 5,500 people volunteered for America’s Grow-a-Row. More than 750 children from low-income areas visited our farm to learn about healthy eating and farming and to harvest fresh food for their families. America’s Grow-a- Row’s Recipient Volunteering program hosted 384 youth and adults at our farm to harvest produce for themselves and for other communities in need, as a way to give back in a meaningful and fulfilling way. America’s Grow-a-Row educated 3,253 people in schools, community centers, churches, and offices about nutrition, healthy eating, the hunger crisis, farming, and volunteerism through our Off the Field education program. America’s Grow-a-Row ran 112 Free Farm Markets. The markets, which run weekly in Newark, Jersey City, and Morristown and bi-weekly in Camden during the harvest season, allow local residents in need to come and select produce at no cost. America’s Grow-a-Row successfully expanded the Morris County Free Farm Market thanks to our Impact 100 Garden State award. America’s Grow-a-Row’s Fresh Produce Initiative with the Community FoodBank of New Jersey provided over 1 million pounds of fresh fruits and vegetables for the FoodBank, marking our second year of delivering 1 million pounds annually, up from 665,000 pounds donated in 2013. America’s Grow-a-Row purchased the Pittstown Farm, our headquarters since 2002, through a series of donations and a mortgage. America’s Grow-a-Row brought all farming activities under our general operations, including hiring farming staff and starting to purchase necessary farming equipment. We have assembled our own farm team, which affords us greater control over operations while we continue to grow funding and programming. Our third annual Farm to Fork Fundraiser, held at Life Camp in Pottersville, New Jersey, honored Bonnie Duncan of the United Way of Hunterdon County, included Keynote Speaker Governor Christine Todd Whitman, and raised $61,000. 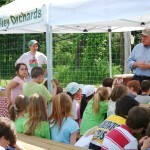 America’s Grow-a-Row’s third annual Pennies 4 Produce fundraiser raised over $8,400. America’s Grow-a-Row’s Ford Motor Company Everyday Hero video was selected by TakePart, a division of Participant Media, a digital news and lifestyle magazine and social action platform for the conscious consumer, to be promoted on their website and social media, resulting in over 3.2 million views. Chip received the Team Walker Leo Zatta Award. Nearly 1.2 million pounds of fresh produce were donated. Our total fresh produce donated since our beginning surpassed 3.7 million pounds. Almost 4,000 people volunteered for America’s Grow-a-Row. Nearly 750 low-income children visited our farm to learn about healthy eating and farming and to harvest fresh food for their families. America’s Grow-a- Row’s Recipient Volunteering program hosted 240 youth and adults at our farm to harvest produce for themselves and for other communities in need, as a way to give back in a meaningful and fulfilling way. 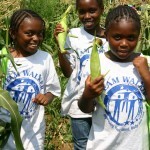 America’s Grow-a-Row educated 3,150 people in schools, community centers, churches, and offices about nutrition, healthy eating, the hunger crisis, farming, and volunteerism through our Off the Field education program. America’s Grow-a-Row expanded our Newark and Jersey City Free Farm Market℠ program to run every week, an increase from every other week in years past, while continuing our existing Free Farm Market℠ in Camden. America’s Grow-a-Row set up a new Free Farm Market℠ in Trenton as part of the Rx for Health initiative developed in collaboration with the Henry J. Austin Health Center; Isles, Inc.; New Jersey Partnership for Healthy Kids; and Rutgers Cooperative Extension. America’s Grow-a-Row continued to expand our Fresh Produce Initiative with the Community FoodBank of New Jersey by delivering 1 million pounds of fresh fruits and vegetables to the FoodBank, up from 665,000 pounds donated in 2013. America’s Grow-a-Row secured $1,250,000 in matching grants to support our capital campaign to purchase the farm in Pittstown where our headquarters is located. Our second annual Farm to Fork℠ Fundraiser, held at Life Camp in Pottersville, New Jersey, honored Jerry Walker of Team Walker, included Keynote Speaker Congressman Leonard Lance, and raised $42,000. Governor Christine Todd Whitman visited America’s Grow-a-Row and spoke to youth visiting the farm through our Free Farm Market℠ program. America’s Grow-a-Row launched our Perennial Club℠ Membership program, offering a variety of membership support levels. America’s Grow-a-Row conducted our second annual Pennies 4 Produce℠ fundraiser run by local students of all ages and at local merchants raising nearly $9,400. America’s Grow-a-Row, in collaboration with the Community Soup Kitchen and Outreach Center of Morristown, won the Impact 100 Garden State $100,000 Award to be used to expand the year-round Morris County Free Farm Market℠. 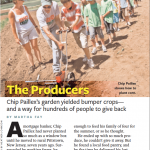 In recognition of his work with America’s Grow-a-Row, Chip was named a CNN Hero. CNN Heroes is a year-long initiative that honors everyday people for their selfless, creative efforts to help others. Chip received the Ford Motor Company Go Further Everyday Hero recognition. 860,000 pounds of fresh produce were donated. Our total fresh produce donated since our beginning surpassed 2.5 million pounds. America’s Grow-a-Row expanded our Fresh Produce Initiative with the Community FoodBank of New Jersey and more than tripled the amount of fresh fruits and vegetables that we donated through the FoodBank. America’s Grow-a-Row planted an additional two acres of crops at our Alexandria Township farm for a total of twelve acres of crops. America’s Grow-a-Row completed the construction of our 19,000-square-foot transportation facility consisting of a new bridge crossing, a parking area, and a truck turnaround at our Alexandria Township farm. 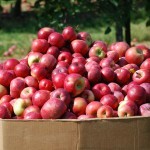 America’s Grow-a-Row signed a two-year lease to purchase agreement to acquire Peaceful Valley Orchards farm. Purchasing this farm with existing infrastructure enables us to maintain appropriate crop rotation, execute additional planting and harvesting events, and donate even more fresh produce to those in need. America’s Grow-a-Row expanded our Free Farm Market℠ program to add a second market in Newark and a new market in East Orange (in partnership with the East Orange YMCA) while continuing our existing Free Farm Market℠ program in Jersey City and Camden. More than 750 inner-city children visited our farm to learn about healthy eating and farming and to harvest fresh food for their families. America’s Grow-a-Row piloted a program that enables recipients of our produce to come to our farm and volunteer so that they can in turn help others in need and give back to the program in a meaningful and fulfilling way. America’s Grow-a-Row educated more than 2,600 people in schools, community centers, churches, and offices about nutrition and healthy eating, the hunger crisis, farming, and volunteerism through our “Off the Field” education program. As part of our education program, we piloted a Grow-Your-Row class to teach people living in urban areas how to grow their own produce on a small-scale basis. America’s Grow-a-Row increased our staff from two full-time and three part-time employees in 2012 to three full-time and four part-time employees in 2013. America’s Grow-a-Row conducted several fundraisers, including a concert in conjunction with Lyrica Chamber Music and a month-long Pennies 4 Produce℠ initiative run by local students of all ages. More than 3,000 people volunteered for America’s Grow-a-Row. 328,000 pounds of fresh produce were donated. America’s Grow-a-Row installed a well at our Alexandria Township farm. America’s Grow-a-Row partnered with Partners in A.C.T.S. of Newark and Team Walker of Jersey City for two additional Free Farm Market℠ programs, as well as continuing our Free Farm Market℠ in Camden. 750 inner-city children from across New Jersey visited our farm to harvest fresh food for their families through our Growing Healthy Kids Days℠. 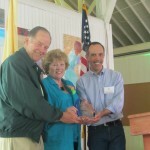 America’s Grow-a-Row was chosen for Edible Jersey’s 2012 Local Hero Non-Profit Award. More than 2,100 people volunteered for America’s Grow-a-Row. 1,729,000 million pounds of produce have been donated since America’s Grow-a-Row began in 2002. Former Governor Thomas H. Kean was the guest speaker at our Farm to Fork℠ fundraising event. 325,000 pounds of fresh produce were donated. 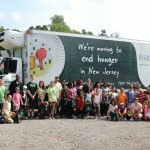 Chip was appointed to the New Jersey Hunger Prevention Advisory Committee. America’s Grow-a-Row began making capital improvements to our new farm. America’s Grow-a-Row partnered with the Camden Coalition of Healthcare Providers to set up a Free Farm Market℠ in downtown Camden and began making produce deliveries to additional locations in Camden. Over 50 children from Camden and 85 children from Paterson visited our farm to learn about farming and harvest fresh food for their families. More than 1,700 people volunteered for America’s Grow-a-Row. 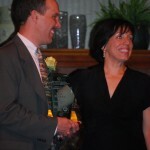 Chip received the Bank of America Neighborhood Excellence Initiative Local Hero Award. 375,000 pounds of fresh produce were donated. America’s Grow-a-Row received statewide recognition when Chip was honored as one of New Jersey’s Heroes by New Jersey Governor Chris Christie at the Governor’s Inauguration. 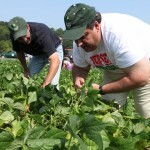 Governor Chris Christie and his family and staff came out to our farm to pick green beans and help those in need. 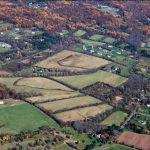 America’s Grow-a-Row purchased a 138-acre property of preserved farmland in Alexandria Township, New Jersey with the help of two benefactors. Over 70 children from Camp YDP in Paterson visited our farm to learn about farming and pick fresh produce to take home to their families. America’s Grow-a-Row reached the milestone of donating 1,000,000 pounds of fresh, healthy produce since our beginning. America’s Grow-a-Row launched our first Annual Fund Campaign. 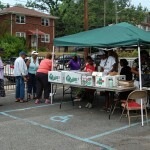 More than 1,100 people volunteered for America’s Grow-a-Row. Chip received the Russ Berrie Making a Difference Grand Prize Award, the Hunterdon County Chamber of Commerce Good Neighbor of the Year Award, and the Acorn Montessori Community Leader Award. 317,000 pounds of fresh produce were donated. More than 900 people volunteered for America’s Grow-a-Row. 218,000 pounds of fresh produce were donated. America’s Grow-a-Row became an independent 501(c)(3) organization. America’s Grow-a-Row was featured in Reader’s Digest magazine. 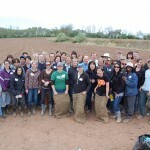 More than 500 people volunteered for America’s Grow-a-Row. Chip was recognized as the Hunterdon County United Way Volunteer of the Year. 115,000 pounds of fresh produce were donated. New Jersey Secretary of Agriculture Charles Kuperus visited and toured our farm. New Jersey Network (NJN) broadcast a television news story about America’s Grow-a-Row. Chip received the National Jefferson Award and the NORWESCAP Outstanding Community Service Award. 27,000 pounds of fresh produce were donated. 15,000 pounds of fresh produce were donated. 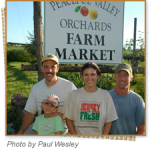 Chip expanded the program into a mission project of the Bethlehem Presbyterian Church in Pittstown, New Jersey using land donated by Peaceful Valley Orchards, also in Pittstown. America’s Grow-a-Row was featured in an article in the New Jersey section of the Star Ledger newspaper. 6,000 pounds of fresh produce were donated. America’s Grow-a-Row was first recognized in the Hunterdon County Democrat newspaper. 3,000 pounds of fresh produce were donated. 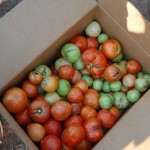 120 pounds of fresh produce were donated. 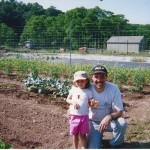 America’s Grow-a-Row started with a small plot and a single volunteer, Chip Paillex, and his 4 year-old daughter, Kyra. Chip saw a plea from the Flemington Food Pantry requesting that gardeners bring excess produce to the Food Pantry. This plea lit the spark that inspired Chip to grow produce to feed the hungry.